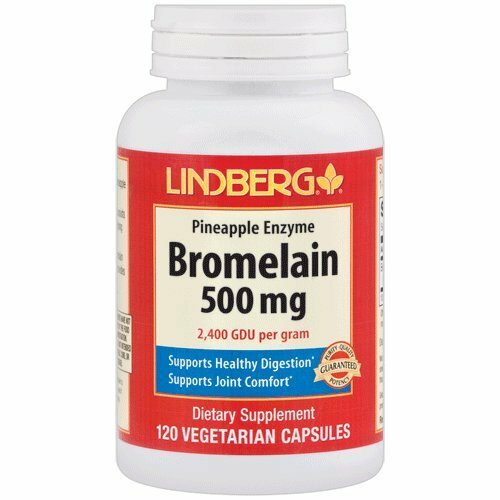 Bromelain is a mixture of protein-digesting enzymes derived from pineapple plant stems. * When taken with food, bromelain assists with the breakdown of protein, helping maintain healthy digestion. * When taken between meals, bromelain helps support joint comfort and may help provide relief from temporary soreness associated with muscle exertion. * This formula provides 2,400 GDU (gelatin digesting units) per gram. Gelatin Digesting Units (GDU) is a measure of the protein digesting activity of an enzyme. Vegetarian Capsules. Vegetarian Formula. If you have any questions about this product by LINDBERG, contact us by completing and submitting the form below. If you are looking for a specif part number, please include it with your message.